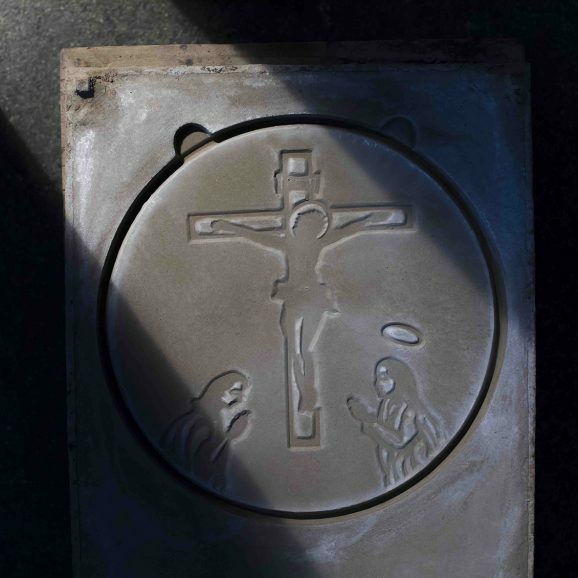 Faith and Crafts Volume 4 "The gods' metal ornament maker: Nobuya Oyanagi's kagura bells"
At a Shinto shrine, the sound of bells purifies visitors and requests the activation of divine power. The kagura bells ("kagura suzu") used in sacred kagura dances and in prayer are made with a total of fifteen bells, in groups of seven, five, and three bells from bottom to top. 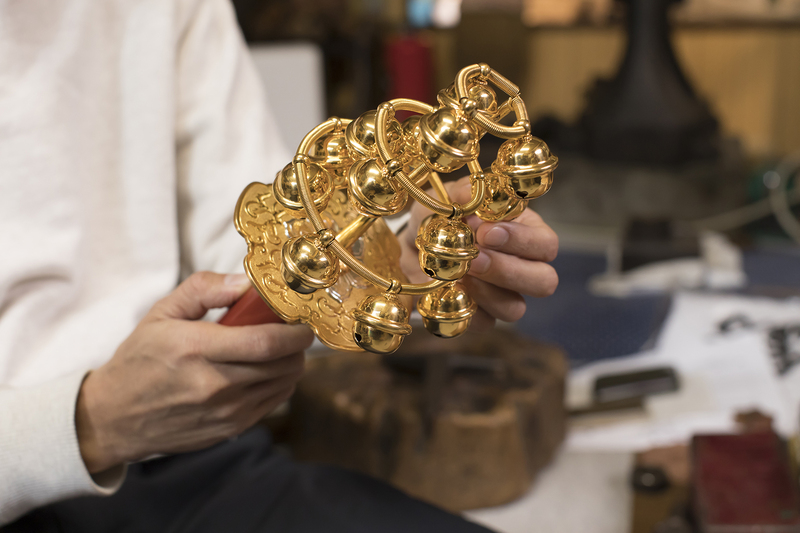 As makers of metal ornaments specializing in the production of objects used in Shinto shrines for generations, Oyanagi Seisakujo makes bells by hand one by one. Sheets of brass are hammered to tighten them, then softened with heat through annealing and hammered again. Two bowl-shaped forms made in this manner are combined to make a round bell, and a brass ball is inserted to make the ringing sound. The metal's thickness and even the slightest warping can affect the bell's sound, and the craftsman must give great thought to whether one last hammer strike is necessary. The metal ornament maker keeps the sound of bells echoing through a shrine in mind to guide his creation to the ideal sound. In times past, Japanese used the onomatopoeia "saya" to describe the sound of bells calling to the gods. The soft, refreshing sound of handmade bells has a purity befitting a place of prayer. Born in Kyoto in 1972. 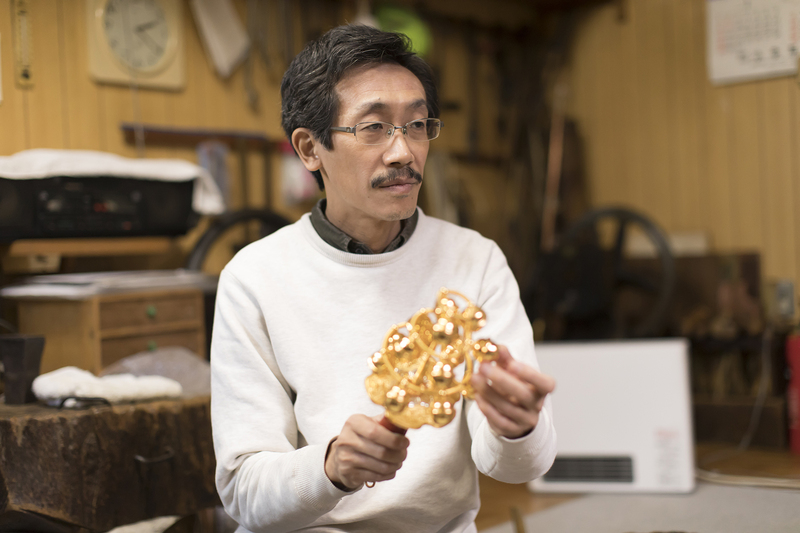 After graduating from university, he joined Oyanagi Seisakujo, maker of metal ornaments used in shrine buildings and implements. He creates handcrafted crowns and kagura bells using traditional techniques and tools. Kyoto’s Nishijin district is well known for its textiles. Walking south along a narrow road from the Nakadachiuri thoroughfare bustling with textile studios, one comes across Oyanagi Seisakujo. It is a metal ornament studio specializing in “jingi chodohin” such as crowns worn by children in rituals or processions and decorations for portable shrines. The term “jingi chodohin” is not a familiar one even in Japanese, and refers to all objects in a Shinto shrine aside from the buildings. 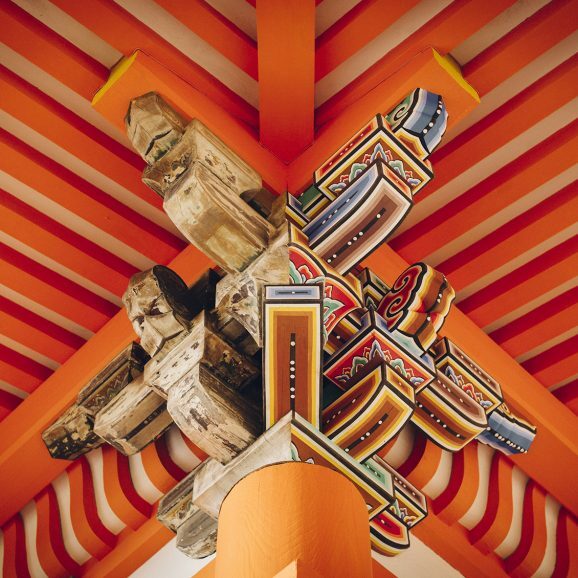 It includes tools such as wooden fans and small wooden stands for offerings, objects of worship such as sacred mirrors and portable shrines, all craft items such as bamboo screens and other interior decorations, and even the clothing worn by Shinto priests—essentially, everything needed in a shrine. As many of the objects have their origins in the culture of the imperial court during the Heian period (794 – 1185), Kyoto is one of the primary producers of these shrine objects in Japan. 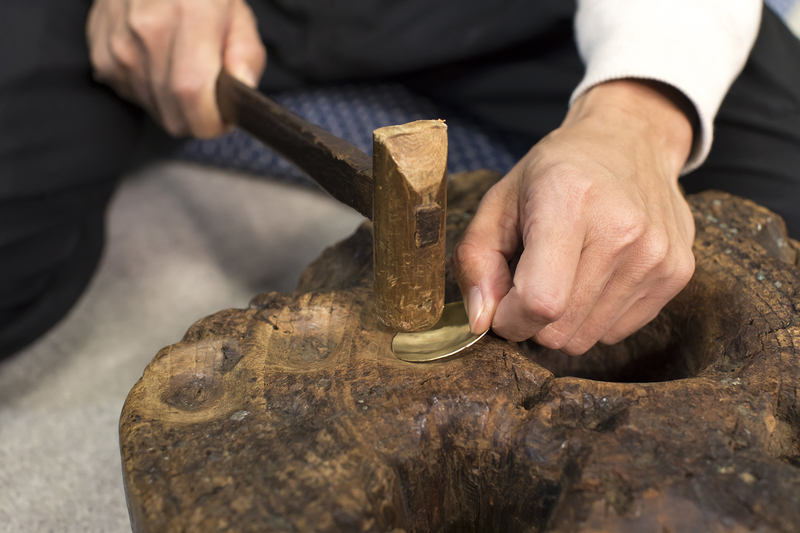 A wide variety of craftsmen specializing in shrine implements—metal ornament makers, woodworkers, bamboo screen makers, crown makers, dye craftsmen and those who make the clothing, and more—are gathered near the Kyoto Imperial Palace to form a center of production. 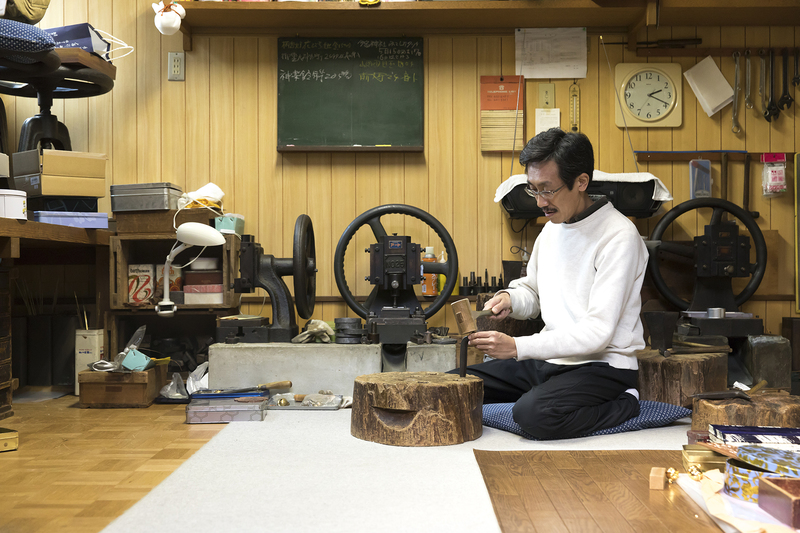 Nobuya Oyanagi and his father Chuzo work in Oyanagi Seisakujo’s studio of about eight tatami mats (roughly 13 square meters). There, Nobuya demonstrated the production process for kagura bells. In recent years, most bells are made by punching metal with a press and bending it into hundreds of rounded shapes at a time with machines. Handmade bells like the ones Oyanagi makes are a rarity. Shinto priests and people who work with shrine implements all agree on that point. The reason goes beyond admiration for handicrafts passed down from ages ago. Machine-made bells, first created to be simple, low-cost items, are made of thinner brass than handmade bells. This is due to cost reduction and ease of machine processing. The thin brass is unable to withstand repeated annealing and hammering without breaking. Instead, the brass is left in a soft state throughout the forming process and as a result the sound doesn’t resonate as much. 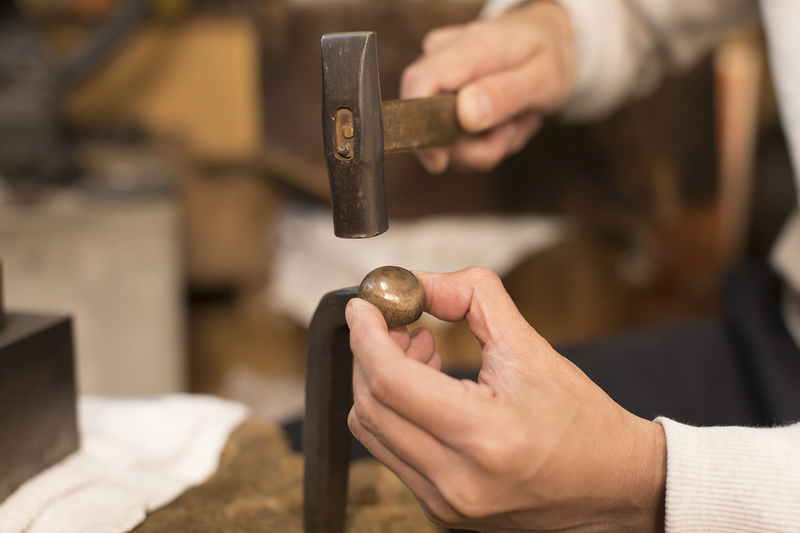 Handcrafted bells, on the other hand, use thicker brass and undergo the annealing and hammering steps over and over. Annealing softens the metal, while hammering hardens it. By rounding the metal little by little by hand, the craftsman gives the brass strength. The hardened, strengthened bell creates a resonant sound, with particular clarity in the high tones. When offering prayers, members of the priesthood use the sound of bells to purify. 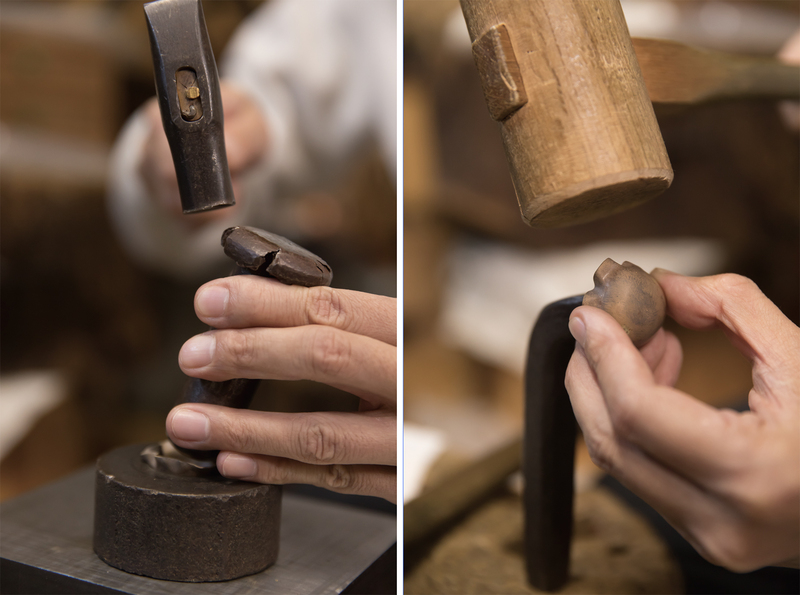 Handcrafted bells, with their thick brass, do not wear out even after 50 or 100 years of use. If the rust that comes with age is removed and the gilding is reapplied, they can likely last until the studio that made them goes through about five generations of craftsmen. 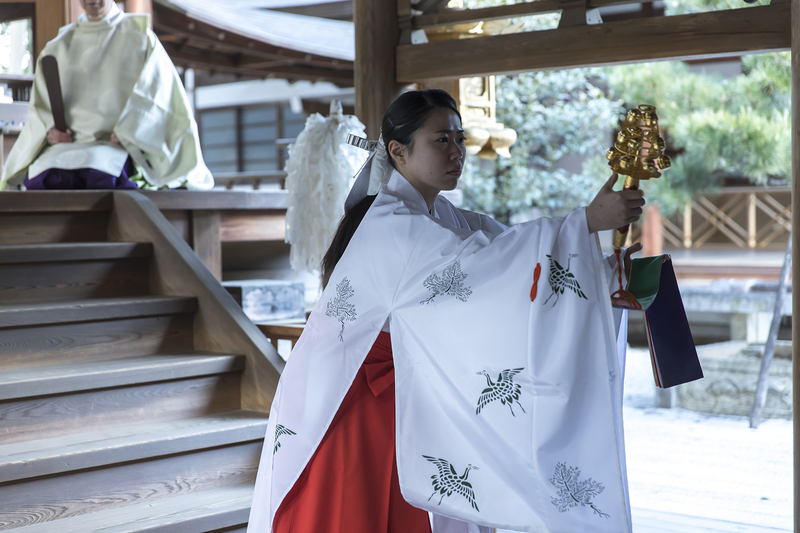 In fact, Oyanagi says most of the kagura bells brought to him for repairs were made by the first generation or even earlier craftsmen. But in the vast majority of shrines, machine-made bells dominate due to their overwhelming price advantage. The last name Oyanagi began with Nobuya’s grandfather. Before that, the business was called Kazarishin and each generation took the name Shinbei Horii. Due to the confusion of the Meiji period (1868 – 1912), the change in family name, and a studio move happening all at once, no records of the family’s past remain and Nobuya simply omits the earlier history when asked about it. In other words, he might actually be the sixth generation, or tenth generation in the business. 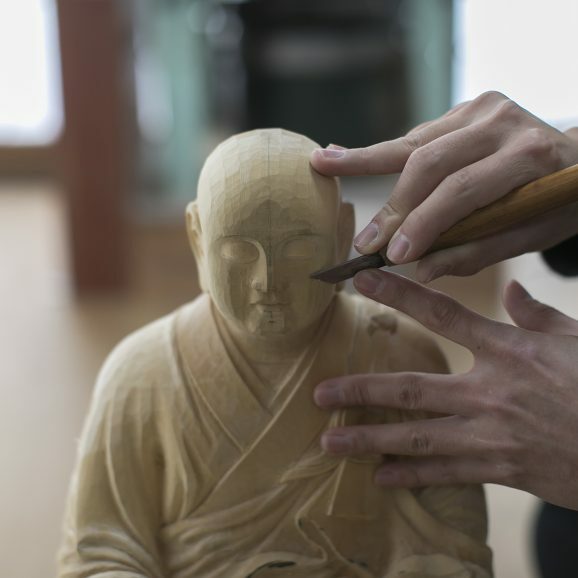 Even without knowing exactly when the business was founded, people involved with shrines and shrine implement production hold the reliability of Oyanagi’s work, dating back to the day of Kazarishin, in high regard. The fact his ancestors’ work comes back to him for repairs and the fact that he can restore them reliably are proof of that. Oyanagi has a son who is currently in elementary school. “I’d be happy if he took over the family business, and right now he tells me he wants to do that,” he says.